Simply purr-fect! Enjoy the cuddly cuteness of kitties without the fuss and muss they sometimes bring. 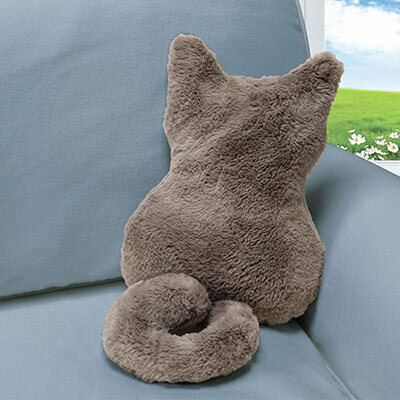 Our fun and fuzzy cat-shaped Bashful Kitty Pillow features a faux fur cover and soft, super-plush polyfill insert. Pointed ears and a sweet curling tail add a touch of reality. Polyester/polyester fill. Spot clean. Approx. 13"h.